I am located at 9, 43-45 Lysaght Street Coolum Beach at the industrial estate. 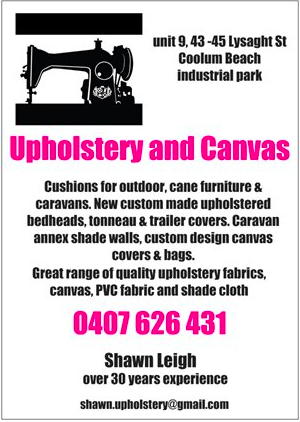 I recover and make cushions for outdoor, cane and caravan furniture, repair and recover dining chairs, make new upholstered bedheads and ottomans, tonneau covers and side curtains for utes, trailer covers, caravan annex shade walls and custom design canvas bags and covers. I use quality Warwick Fabrics, PVC and canvas. I am a coast local and in business for over 30 years.